German, which differs in certain respects from the version spoken in Germany. Individual tables can be downloaded here (table numbers can be found from this route plan). An offline journey planner can also be downloaded here. ÖBB no longer publish a complete printed timetable, but do issue timetable booklets for each route (usually available only in the area in question). Table numbers can be found from this route plan. This page provides a pictorial map giving the location and type of engineering work and other incidents for ÖBB, and also significant events on neighbouring railway administrations. A map of the network showing the locations and dates of engineering works in 2016, by quarter, is present here. A map of the network showing the locations and dates of engineering works in 2017, by quarter, is present here. The summer provides opportunity for engineering work which can result in sections of line being closed, with and buses substituted, for many weeks: it pays to check carefully. The ÖBB 'Scotty' Journey Planner can be used to plan bus journeys. ÖBB Postbus timetables can be downloaded from the Postbus website. “Eisenbahnatlas Österreich”, the second edition of which (ISBN 3-89494-138-3) was published in 2010 by Verlag Schweers + Wall GmbH, similar to atlases from the same publisher for Germany, Italy & Slovenia, and Switzerland. An overall system map dated 2018/19 is provided at OEBB INFRA Map. Sporenplan has a number of on-line schematic track diagrams. Click on "Sporenplannen" on the left hand side for a map showing the countries covered. Thorsten Büker's Map of Austria and Map of Vienna. Not updated since November 2011. Infrastructure is owned and managed by a public authority, ÖBB-Infrastruktur AG. The Network Statement page gives access to the latest network statements. ÖBB is entirely standard gauge. Various Other Railways are narrow gauge, as noted below. between Neusiedl am See (exclusive) and Fertöszentmiklós (the electrification boundary is a few hundred metres south of Neusiedl station). Many lines are single track and most double track railways are signalled for reversible working. Most double track lines in Austria operate with right-hand running, although many lines in the east of the country once operated with left-hand running, a hangover from the days of the Austro-Hungarian Empire. The Wien to Graz line still operates with left-hand running south of Payerbach-Reichenau. ÖBB intends to convert most of the remaining lines, although conversion of Mürzzuschlag - Bruck a d Mur - Graz (where major investment would be required) is likely to be related to the Südstrecke project. The only other line with left-hand running is Wien FJB - Tulln - Absdorf-Hippersdorf, which is an isolated section of double track. The best source is the “Eisenbahnatlas Österreich”; see #Printed Maps. Many of these are government (regional or local) owned, rather than owned by private companies. Table numbers in the Fahrpläne Österreich are shown in brackets and can also be found from this plan. St Polten Hauptbahnhof – Mariazell Mariazellerbahn (115) (760mm gauge) Electrified at 6.6 kV 25 Hz. Raab-Oedenburg-Ebenfurter Eisenbahn AG: An international railway in joint Austrian and Hungarian ownership, better-known by its Hungarian name, Györ-Sopron Ebenfurti Vasút (GySEV). Raab and Oedenburg are the German names for Györ and Sopron respectively. The line from Ebenfurth to Sopron is electrified at 25 kV 50 Hz and used by dual-frequency ÖBB trains between Sopron and Wien Südbf. GySEV also owns the line between Sopron and Györ, which is entirely in Hungary and electrified at 25 kV 50 Hz. Neusiedl am See – Fertószentmiklós (731). Salzburg Hauptbahnhof (platforms 11 and 12) - Lamprechtshausen Salzburger Lokalbahn (210). Electrified 1000 V dc. Bürmoos – Trimmelkam – Ostermeithing Salzburger Lokalbahn (210). Electrified 1000 V dc. Unzmarkt – Tamsweg Murtalbahn (630) (760 mm gauge) Plans to convert this line to standard gauge have been abandoned, but see ​"Projects under way or planned", below..
Mixnitz – St Erhard (760 mm gauge) Electrified 800 V dc. This line is owned by Mixnitz-St.Erhard AG, a wholly owned subsidiary of Veitsch-Radex GmbH, but managed by STLB. It is possible to charter passenger trains or passenger coaches on freight trains. Vorchdorf-Eggenberg – Brauerei Eggenberg (freight only). Stubaitalbahn (Innsbrucker Verkehrsbetriebe und Stubaitalbahn G.m.b.H.AG): Innsbruck – Fulpmes (320) (Metre gauge) Electrified 900 V dc. Operated by tram-style vehicles which work through on to the Innsbruck tram system at 750 V dc. Westbahn Management G.m.b.H: Wien Westbahnhof – Salzburg (100, 101). The first open access operator in Austria; runs an hourly semi-fast service between Wien and Salzburg. Listing current at September 2016 with updates where known. Various lines listed under Other Railways, above, are wholly or largely tourist operations but are not repeated here. Some of the following lines are commercial operations but most are supported by preservation societies. Achenseebahn AG: Jenbach Achenseebf – Achensee Schiffstation (metre gauge, rack operated). This line is potentially in danger of closure at the end of the 2019 season owing to poor track condition. Feistritztalbahn (Feistritztalbahn Betriebsges.m.b.H.) : Birkfeld – Anger – Weiz (760 mm gauge) Operated in conjunction with Club U44. See also Recent Changes, below. Liliput-Bahn (Liliputbahn Prater G.m.b.H. ): Wien's historic 15 inch gauge line - ca. 3.9km circuit in Prater park. Also operate separate Donaupark line. Mostviertler Schienenradl: Ruprechtshofen - Wieselburg an der Erlauf (760 mm) Operations ended in Autumn 2018 as they plan to relocate to Lunz am See on the Ybbsthalbahn Bergstrecke and run to Stiegengraben, probably commencing in 2020. Wien has a third rail U-Bahn (much of which is above ground) and several sections of overhead-electrified U-Bahn tramway with metro characteristics. A track plan is available on the Gleisplanweb site. Gmunden, Graz, Innsbruck, Linz, Wien (which extends via the Wiener Lokalbahnen into Baden). The Wien system is the largest European network outside Russia. Track plans for the systems of Graz, Linz, Innsbruck and Wien are available on the Gleisplanweb site, and most were current at 2018 [Linz 2016]. ÖBB-Infrastruktur will electrify the last remaining section of unelectrified track in Tirol by the end of 2019 at 15 kV 16·7 Hz. This is the 14·4 km of line between Reutte and Schönbichl at the German border. This will include two blockades of the route; from 16 March to 26 April 2019 and from 14 September to 9 November 2019. Electrification of the Gailtalbahn (Arnoldstein - Hermagor) commenced in July 2018 with a planned completion for December 2019; Hermagor – Kötschach-Mauthen closed to passengers in December 2016. A lengthy closure with bus substitution will take place from 9 July to 14 December 2019, further to a closure in late 2018. The Kärnten Land government envisages that all remaining lines in Kärnten will be electrified by 2025. Wien U-Bahn Line U4 is to be closed between Längenfeldgasse and Karlsplatz in July and August 2019 for modernisation. Preliminary work has started on rerouting line U2 and transferring part to a new line U5 - see plan here - with target date for implementation of 2023. Regiobahn have aspirations to restore regular all-year service to the Korneuburg – Ernstbrunn branch. Electrification of Klagenfurt – Weizelsdorf was agreed in early 2016 by ÖBB and Kärnten Land, although it is not known when this is to be completed. Weizelsdorf – Rosenbach closed to passengers in December 2016. Electrification of Gänserndorf - Marchegg is part of an upgrade of the Wien - Bernhardstal - [Breclav] line to be completed by 2026. The plan to convert part of the Murtalbahn (Unzmarkt - Tamsweg) to standard gauge and electrify it has been abandoned. However the line will be reconstructed, with four realignments. Unzmarkt - Murau will be done in 2019 - 2022 and Murau - Tamsweg in 2022 - 2026. Information (in German) about ÖBB's major infrastructure projects an be found at their website. The major project to improve service between Wien, Graz, Klagenfurth, Villach and Tarvisio [IT], the Südstrecke project, is due for completion in 2026. As part of this project, work continues on the Koralmbahn element, to link Klagenfurt and Graz: the 32 km Koralmtunnel is its centrepiece and target completion date for this section is 2023. The first section between Werndorf and Wettmannstätten (table 550) opened on 12 December 2010. ÖBB plans to electrify and resignal the section of the Lavanttalbahn (KBS620) from the future junction with the Koralmbahn just north of St Paul as far as Wolfsberg. This will allow fast services to run between Klagenfurt and Wolfsberg via the Koralmbahn. It is reportedly planned to double sections of the Steirische Ostbahn (Graz – Gleisdorf – Szentgottard [HU]), but information on this is sparse: Wikipedia's Steirische_Ostbahn entry indicates a south to east Graz avoiding line (otherwise any trains between the Koralmbahn and Szentgottard would have to run round in Graz) but states that the start of the project has been delayed due to its relatively low priority in the general transport plan. The project does not appear in OeBB Infra's list of projects. 152 Haiding – Aschach an der Donau (service very limited). The Linzer Lokalbahn ("LiLo") should be taking over the Eferding - Aschach section 'in the future'. This would presumably mean an improved service over this part of the line. 311 Jenbach - Achensee. The Achenseebahn is potentially in danger of closure at the end of the 2019 tourist season owing to poor track condition. As it is a tourist line, the Tirol region does not wish to subsidise it. However, if it had a daily passenger service, the region would be required by law to do so. The closure threat is no doubt the first stage in an attempt to gain funding for renovation. 142 Linz Urfahr - Rottenegg – Aigen–Schlägl. The section between Linz Urfahr and Rohrbach was planned for conversion into tram-train operation, with the rest of the line being shut. 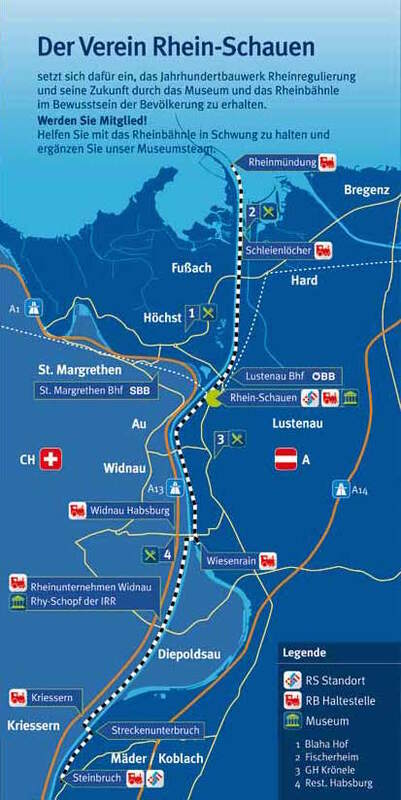 If train-tram went ahead, at Rohrbach a new line, 2.8 km long, would be built towards the town centre, and at Linz a new line from Urfahr to Hauptbahnhof but the Oberösterreich Land Parliament wishes to keep the existing railway and reconnect it with the main rail network. Current plans suggest that a heavy-rail S-Bahn line may be built to connect Linz Hbf with Linz Urfahr, but completion is not expected until at least 2025. (620) Bleiburg – Holmec (Slovenia) - Prevalje has been threatened with closure in the past, but will gain a two-hourly service on Mondays to Saturdays in December 2019 under the designation S11. In late 2011 OeBB presented their plans for the period to 2025, which included a wish to give up some 700 km of branch lines - either by handing to regional authorities or complete closure. Based on failing to reach a minimum threshold of 2000 passengers per day, the passenger lines identified (other than those already listed above or already closed) are listed below. A note is given of any overt action towards closure that has been reported subsequently. Innsbrucker Mittelgebirgsbahn, the light rail line to Igls operated as route 6 of the Innsbruck tram system, has in the past been threatened with closure but will now be operated as a Museum Tramway. The Aspangbahn has been realigned for a distance of around 1km between Laxenburg-Biedermannsdorf and Maria Lanzendorf where it crosses the Pottendorfer Linie (Inzersdorf - Ebenfurth) on a new bridge, 200m north of the previous one. A further extension of the S31 (Gleisdorf - Weiz) from Weiz Zentrum to Weiz Nord was opened to passengers on 10 September 2018. The section from Weiz Bahnhof to Weiz Zentrum opened on 4 June 2016 when the line to the original terminus at Weiz (formerly Weiz Stadt) was closed. The residual passenger service, mainly for school traffic, between Wolfsberg and Bad St. Leonhard (KBS620) was definitively withdrawn on 10 December 2017. It had been operated by replacement bus since 5 March 2017. The line remains in use for freight. The 4.6km southern extension of Wien U-Bahn line U1 from Reumannplatz to Oberlaa opened on 2 September 2017; from the same date, tram 67 ceased to run south of Reumannplatz. Because of storm damage, the Erzbergbahn has operated only between Vordernberg Markt and Erzberg (thence to Eisenerz out of service) since 2016. The Weiz - Oberfeistritz (Steiermärkische Landesbahnen) line was temporarily closed following the last train on 24 December 2014 owing to the poor condition of the Bachl viaduct and the Hardt-Puch tunnel. The Oberfeistritz - Birkfeld section was leased to Club U44, which moved all its rolling stock to the then cut off Birkfeld. However patronage fell considerably in 2015 so the Steiermark Region sold the entire line to the Feistritztalbahn Betriebsges.m.b.H. in February 2016 for a nominal €1 and contributed €235,000 for repairs. The line reopened for seasonal passenger service throughout between Birkfeld and Weiz in April 2016 (see Tourist Lines). Operation by Lavamünder Bahn- und Betriebs GesmbH (LBB) on the closed line between St.Paul and Lavamünd ceased in 2015 - see press report (in German). A 2.8 km extension of the Salzburger Lokalbahn (SLB) from Trimmelkam to Ostermeithing was inaugurated on 12 December 2014. Wien Hauptbahnhof was officially opened on 10 October 2014 (although work continued until opening of all facilities - with through services, use of newly built flyovers at the west end and diveunders at the east end - could take place). 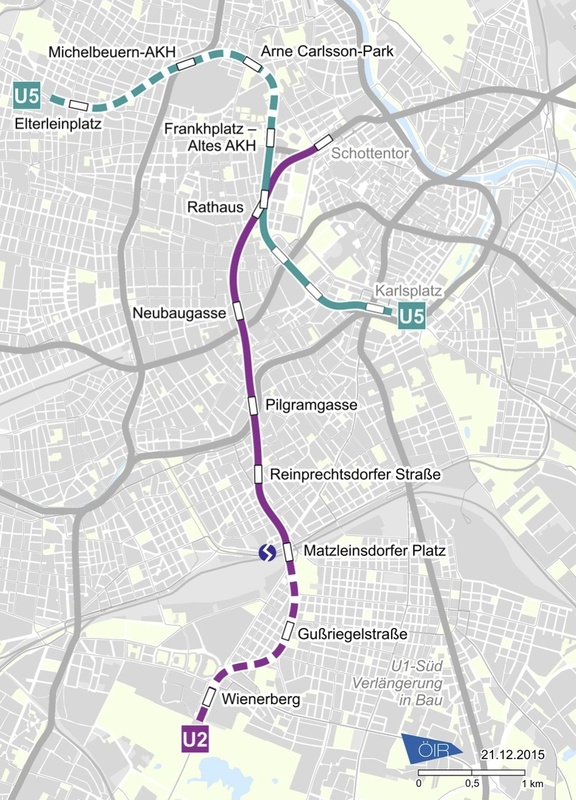 All long-distance trains from the Westbahn - which formerly used Wien Westbahnhof - now use the Lainzer tunnel and Hauptbahnhof - the replacement for Südbahnhof. The new station had been partially opened on 9 December 2012, in connection with which two U Bahn stations were renamed; Wien Südbahnhof became Quartier Belvedere, and Südtirolerplatz became Wien Hauptbahnhof. At the same time the metro station Südtirolerplatz became Südtirolerplatz-Hauptbahnhof. A new motive power and carriage depot has been built on what has been freight yard and sidings at Matzleinsdorfer Platz between Wien Süd and Meidling. In December 2014 a flyover was opened across Kledering Yard (Wien Zvbf) to connect the Wien – Hegyeshalom line with Kaiserebersdorf. This provides a direct route between the new Hauptbahnhof and Flughafen Wien (VIE) (the airport), used twice hourly by railjet and Intercity services, as an alternative to the City Airport Train and S7 route to Wien Mitte. The Wien Hadersdorf - Meidling – Wien Hütteldorf section of the Neue Westbahn opened to freight in late 2012 and to passenger services to Wien Hauptbahnhof in December 2014. The limited passenger services to/from Vienna Westbahnhof to Tulln and beyond via the Tullnerfeld avoiding curve off the High Speed Line were rerouted to/from Tulln to terminate at Tullnerfeld station at the December 2014 Timetable change. In early 2014 the metre gauge branch from Vorchdorf-Eggenberg was slightly shortened when its terminal station, Gmunden Seebahnhof, was relocated inland to a new site between Gmunden Traundorf and the old Seebahnhof. Construction started in March 2014 of a new connecting line from this new station to Rathausplatz. The initial section from Seebahnhof to Klosterplatz opened on 14 December 2014. The closed section of the Gmunden town tram line from Rathausplatz to Franz Josef Platz was rebuilt, providing a through route between Gmunden Bahnhof and Vorchdorf-Eggenberg, and opened on 1 September 2018. A sketch map is available. The seasonal service on the Korneuburg – Ernstbrunn branch ceased in 2014 but had resumed by 2016 with a changed operator Regiobahn. Regiobahn have aspirations to restore regular all-year service to the line. The Kammer-Schoerfling branch was cut back by around 500m in June 2014, thus eliminating 2 level crossings. A new terminal station was opened on the west side of the current line at a slightly lower level, involving around 200m of new alignment. The Wien Liesing – Waldmühle branch, which had no booked traffic other than excursions operated by Verein Pro Kaltenleutgebnerbahn, was legally closed in January 2014 but the preservation organisation have resumed services, including some through trips to and from central Wien, since 3 September 2017. For details of older changes dating back to the year 2005 see Austria - Older General Information. Explanations in English of Austrian (and German) railway signalling can be found here. Tourist railways up mountains are often of limited capacity, but subject to high demand, particularly at holiday periods and during the winter sports season. In such cases it may be necessary to wait some time before being able to board a train, so it is best to arrive at the railway as early in the day as possible. When booking a trip it is often necessary to reserve a seat on a specific train down the mountain. Once the railway’s capacity to bring people back down the mountain is fully booked, no more can ascend, unless they are staying at a summit hotel. This page was last edited on 2 April 2019, at 10:00. This page has been accessed 139,787 times.